Demo Windows Phone 7 from anywhere. 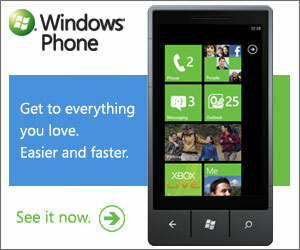 WP7 may not be as popular as other competitors such as Android and Apple iPhone in terms of popularity. For apps, they are still far away from it. Because for these reasons, not many people wants to give a try to use and figure out how the functionalities work. I have some of my friends asking me why I am not using iPhone or Android and some others are asking me for advise. To me in general, windows phone is a social phone, simple really nice to use. That's it. Here are some of the list of whys in my own opinions. You do not have to agree. 1. In terms of accessories its lesser which save you money. 2. Small and elegant. You do not have to worry about closing your apps. The OS will handle for you. 3. Social phone. Less than 3 steps to read your facebook, linkedin and twitter fast. 4. Look and feel according to what you want to access most. eg. Pin your contacts on live tiles. 5. Many designs from different manufacturer and still able to adapt the phone fast as the look and feel in the software is still the same. This is good as you wont see the same phone with your peers and you have many to choose from. 6. Able to merge all contacts, twitters and facebook into one contact. Able to group how you want to organise also and filter who you want to see. If you still confused but still curious to find how it feels like. Go to this link using the browser from your phone.